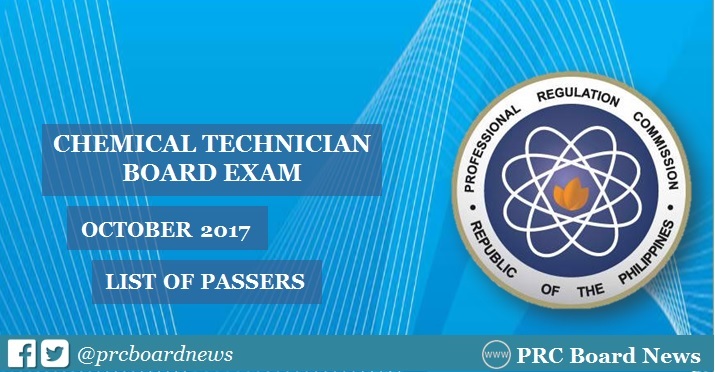 MANILA, Philippines – The Professional Regulation Commission (PRC) and the Board of Chemistry released results of October 2017 Chemical Technician board exam on Wednesday, October 18 or in 2 working days after the exam. The complete list of passers is available on this page as announced online. UPDATE: 720 out of 845 passed the exams. PRC administered the licensure exam in the cities of Manila, Cagayan de Oro and Cebu on Friday, October 12, 2017. GOOD NEWS: Those who failed to pass the board examination for Chemist but had obtained a rating of at least 70% in any two (2) subjects can register as Chemical Technician. The Chemical Technician board exam covered the following subjects: analytical chemistry which deals with practical aspects of qualitative and quantitative chemical analysis (50%) and organic chemistry about the fundamental of basic and practical organic chemistry (50%). According to PRC Resolution No. 2016-1019, the target release of the recent Chemical Technician board exam results is on Monday, October 16 or in 2 working days after the exams. UPDATE: The Malacañang Palace announced the suspension of government work on October 16 and 17 due to nationwide transport strike. With this, results may be released on later date, possible on the following day. In the same period last year, PRC announced results in 2 working days. A total of 64 were qualified for registration as Chemical Technicians. In September 2015 exam, results were out online in just a day after the exam. PRC did not announce list of passers for the Chemical Technician.